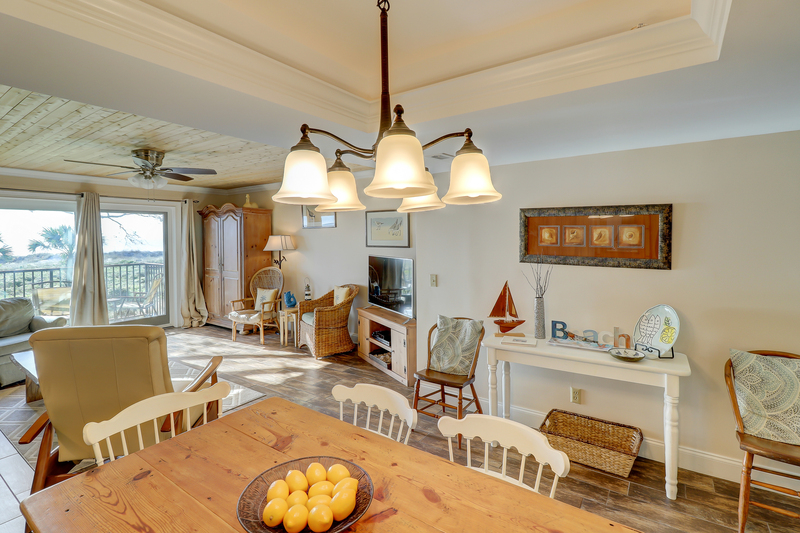 This wonderful oceanfront villa in Ocean Club has been recently renovated and offers a truly enjoyable vacation experience. 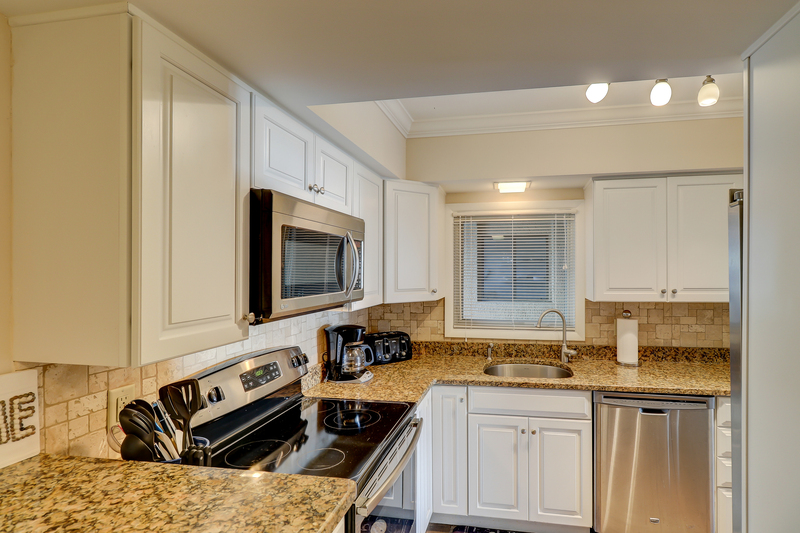 The two story layout has the living, dining, and kitchen areas on the first floor. 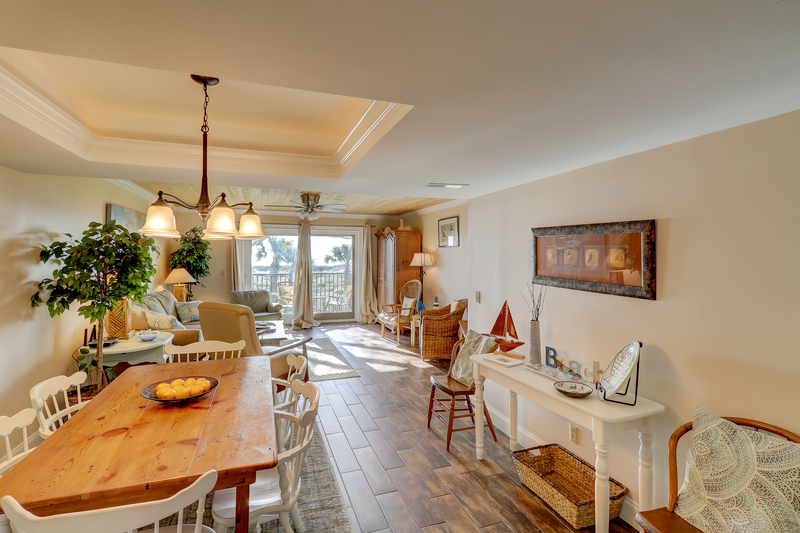 Wood floors with a stressed rustic finish cover the entire first floor. 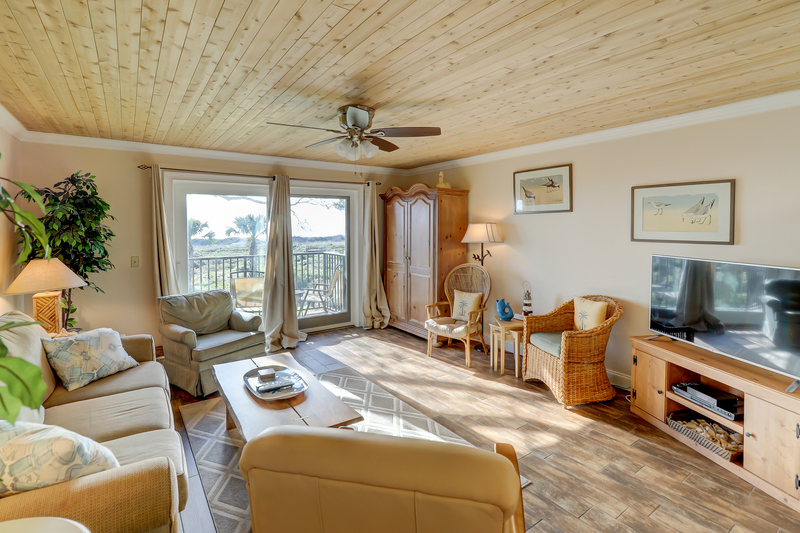 The living area has ample seating with a sofa, two over-stuffed chairs and additional padded wicker chairs. 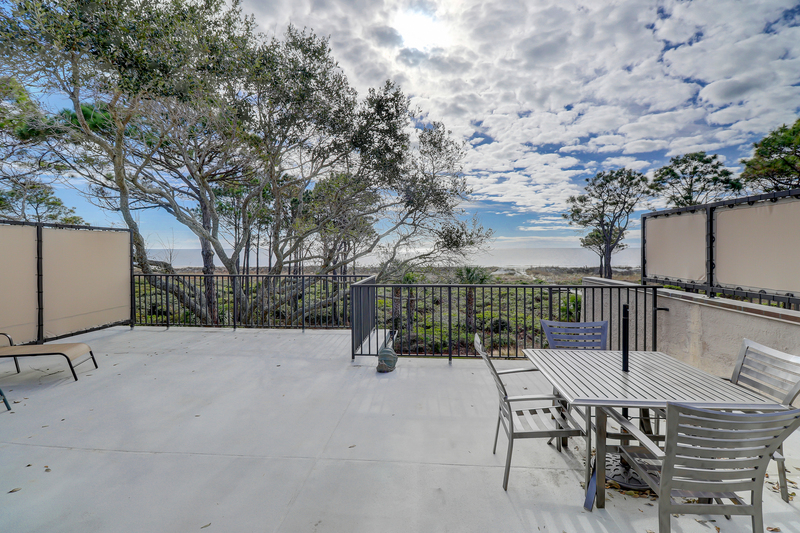 A double sliding door opens to a balcony for a great view of the ocean. 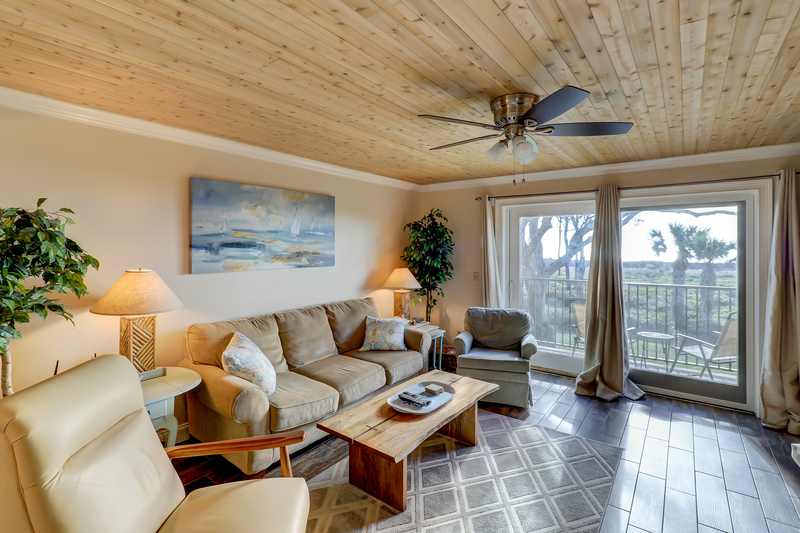 There is also a 47" flat screen TV and DVD player in the living area for entertainment. 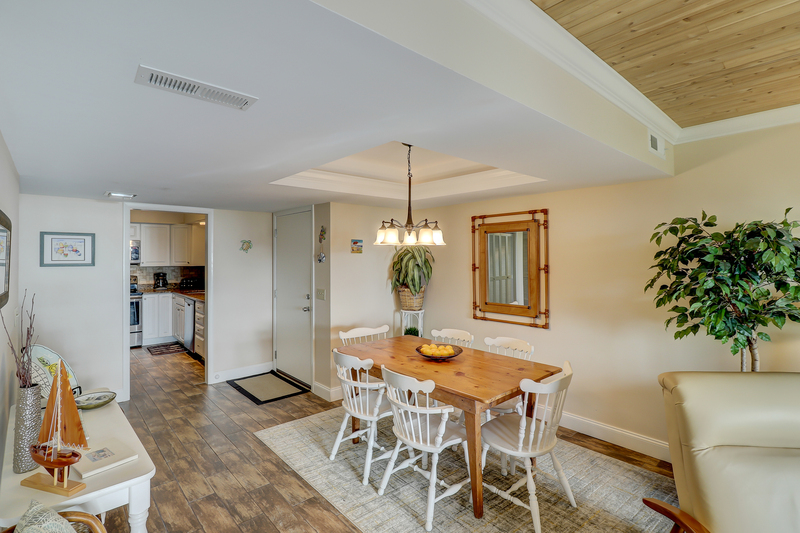 The dining area has a beautiful heart pine table and seating for six. 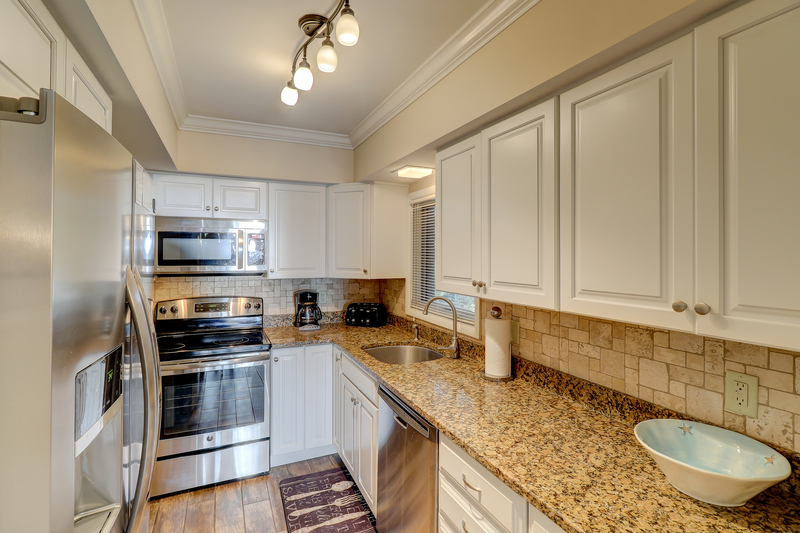 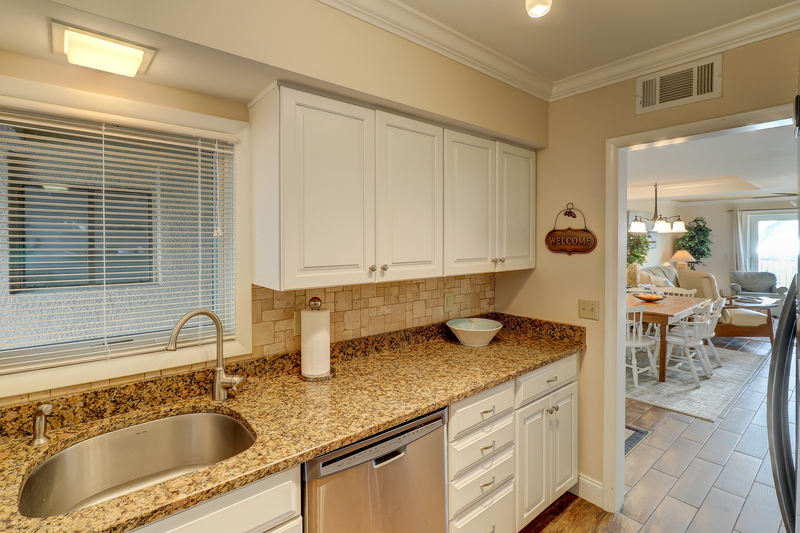 The kitchen has been entirely renovated with l granite counter-tops, custom cabinets, and new stainless appliances. 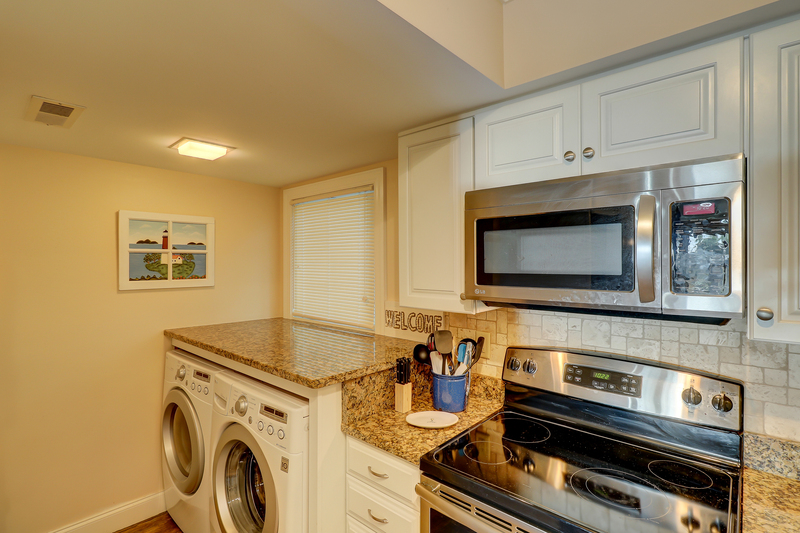 The back portion of the kitchen also has a new under-the-counter and front-loading washer and dryer. 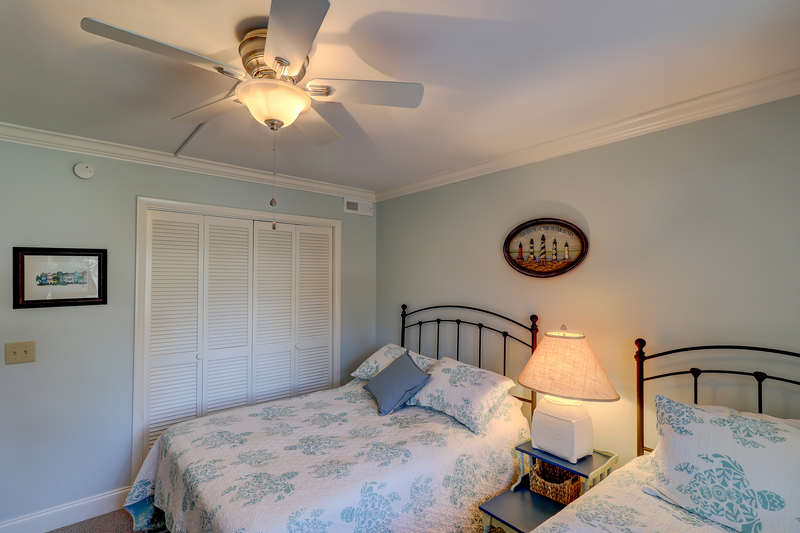 The two guest bedrooms are located on the main floor. 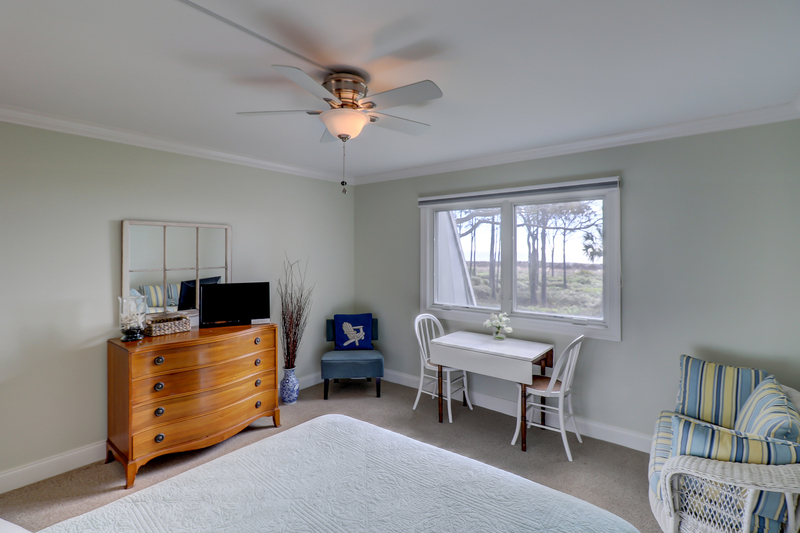 The first has a queen bed, cushioned wicker love seat, and writing desk. 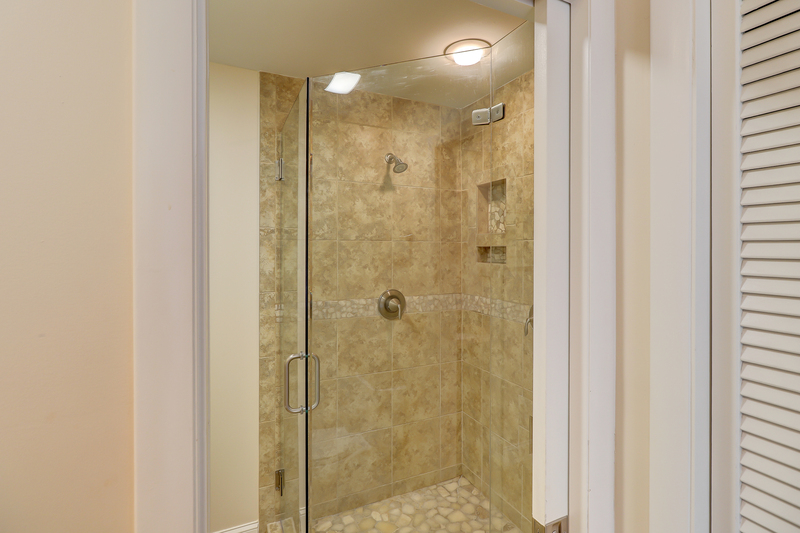 It also has a private bath with granite counter, dark oak custom vanity cabinet, and combination tub/shower surrounded with tiled walls. 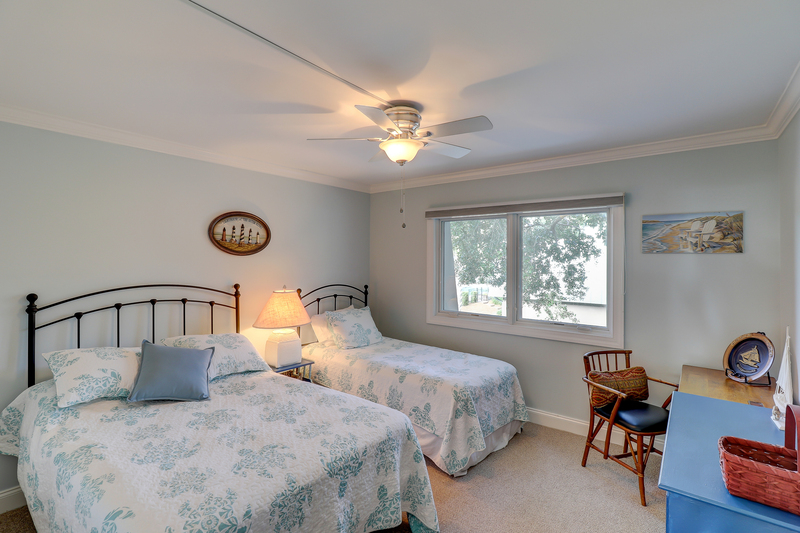 The second guest bedroom has one double and twin bed. 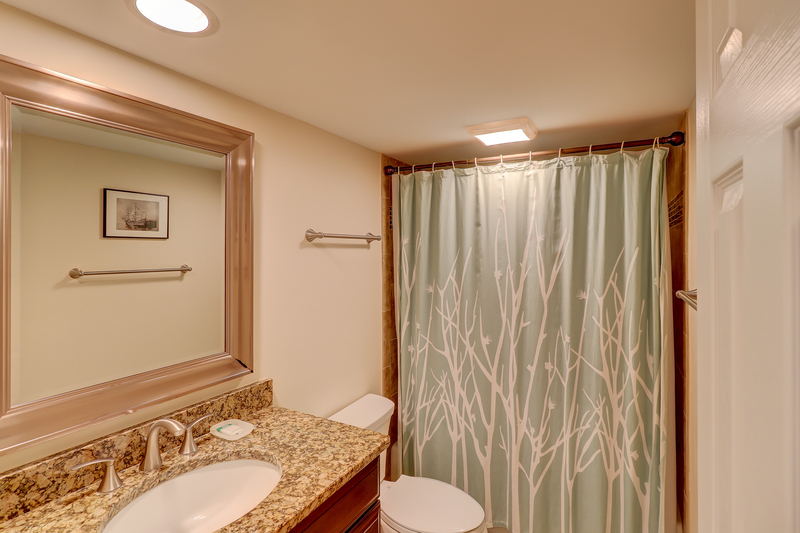 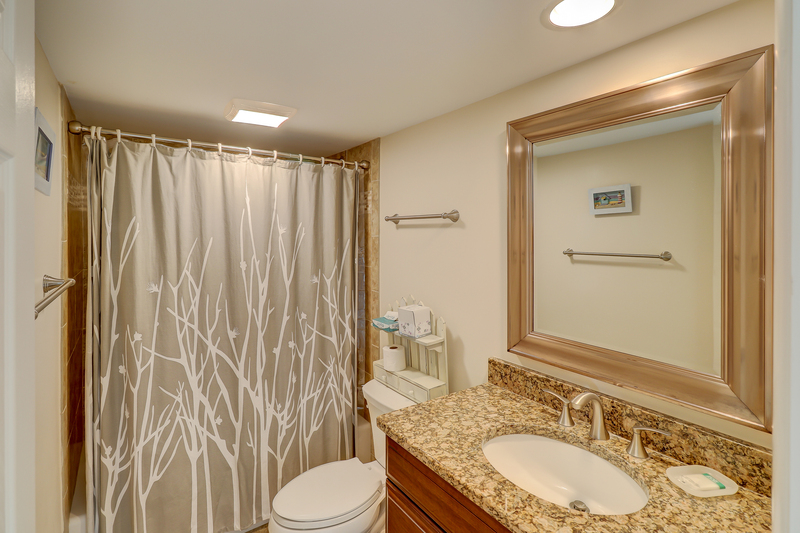 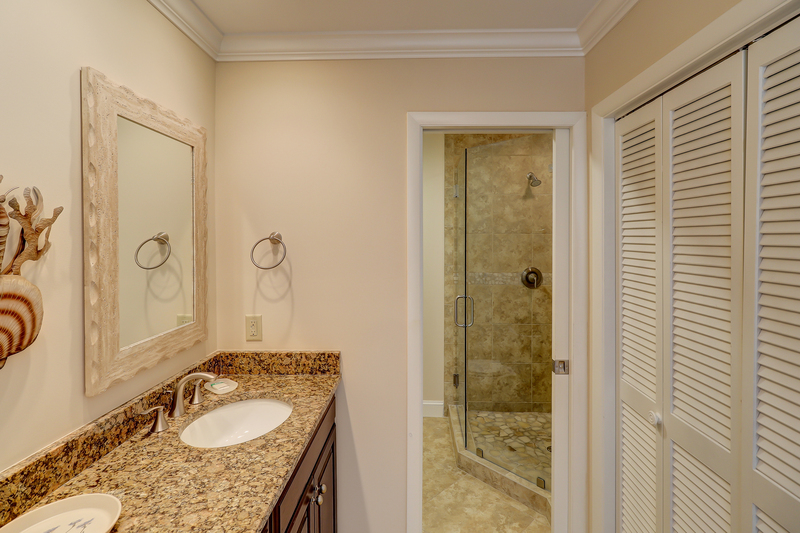 It, too, has its own private bath with granite counter, dark oak custom vanity cabinet, and combination tub/shower surrounded with tiled walls. 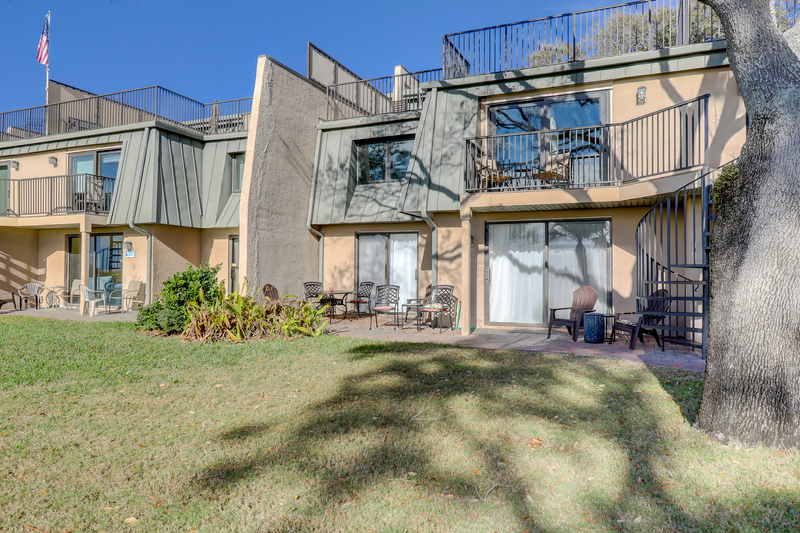 As you walk up the stairs you will find a landing where a sliding door leads to the very spacious deck. 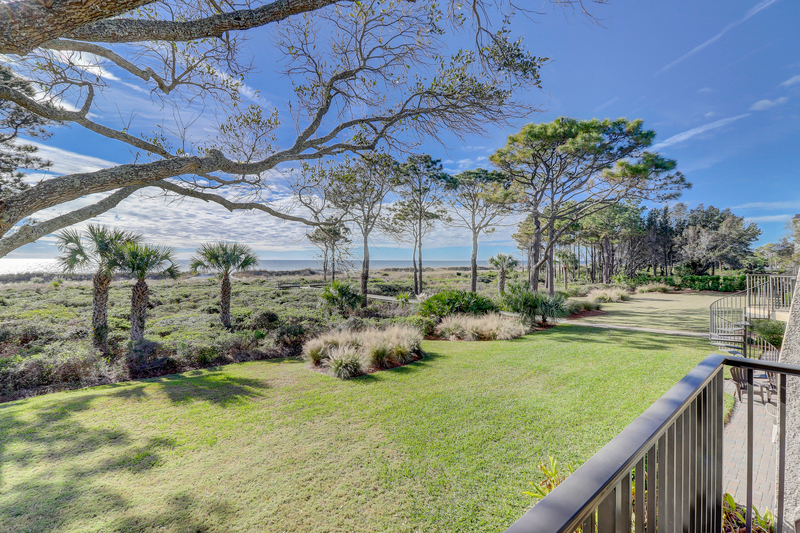 What a wonderful area to enjoy private sun bathing or enjoying beverages and meals while overlooking the natural beauty of the dunes and Atlantic Ocean! 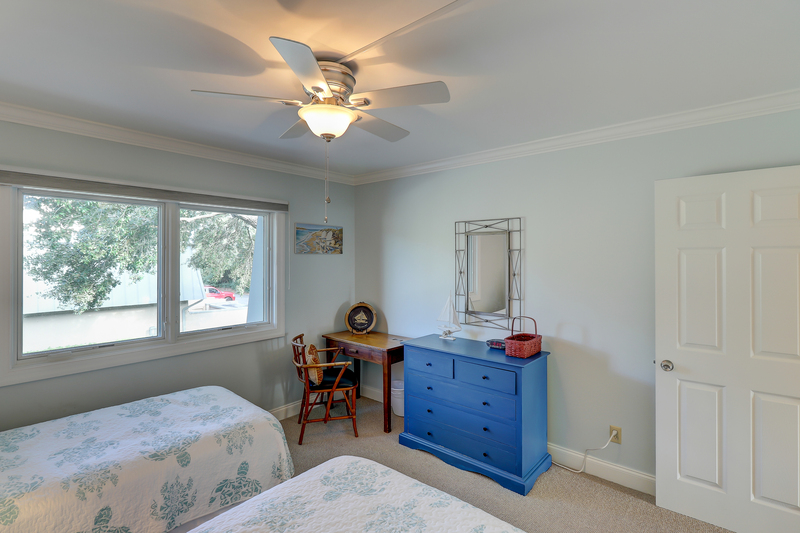 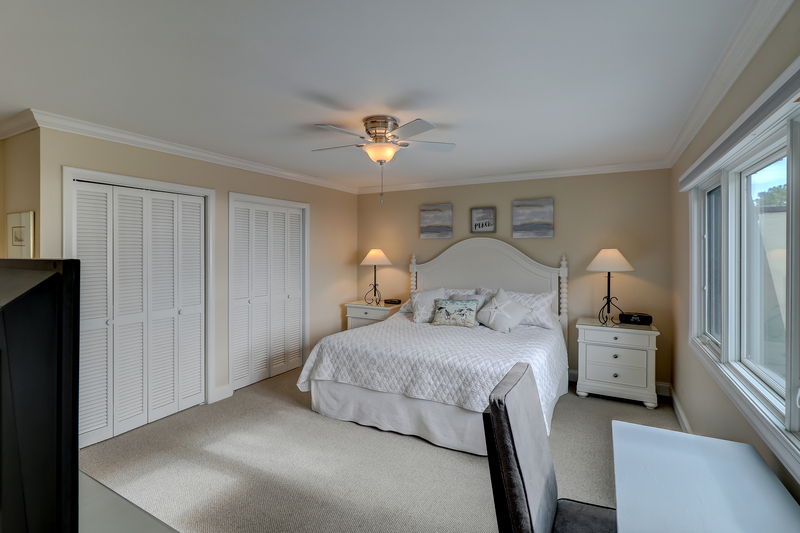 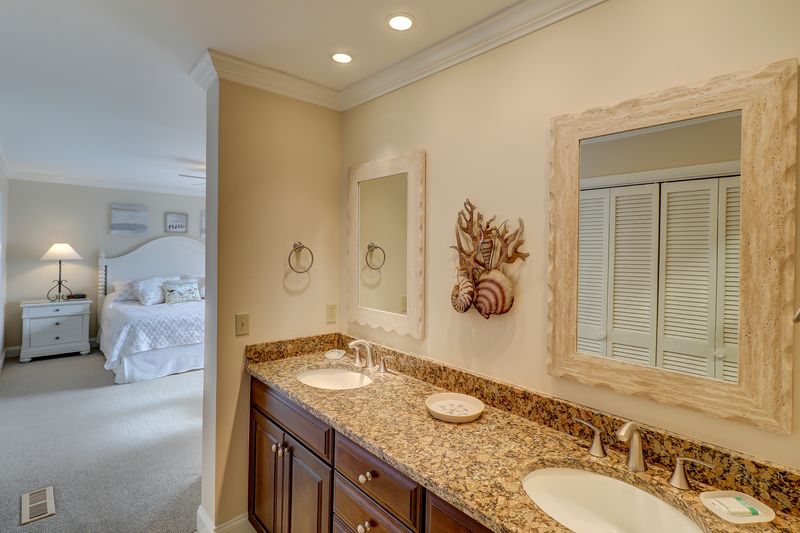 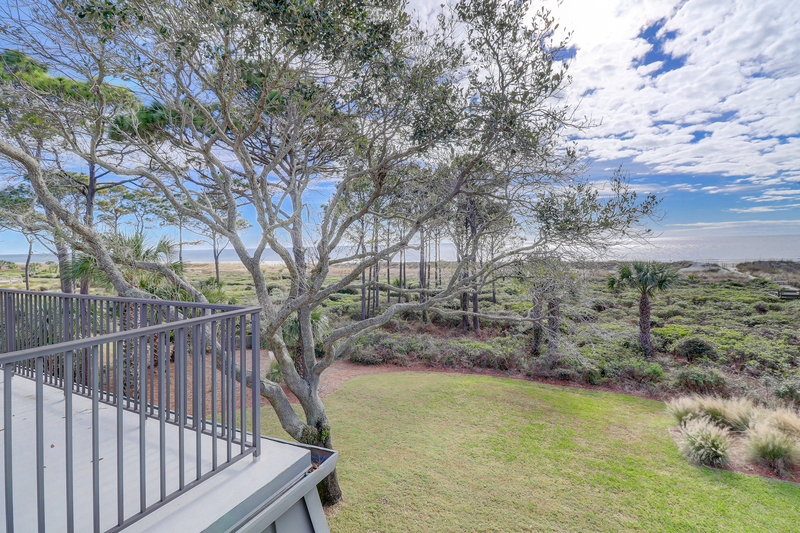 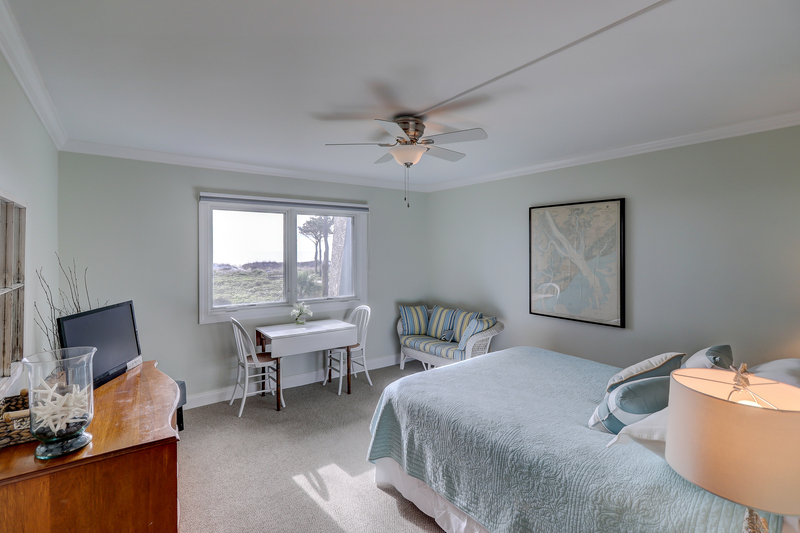 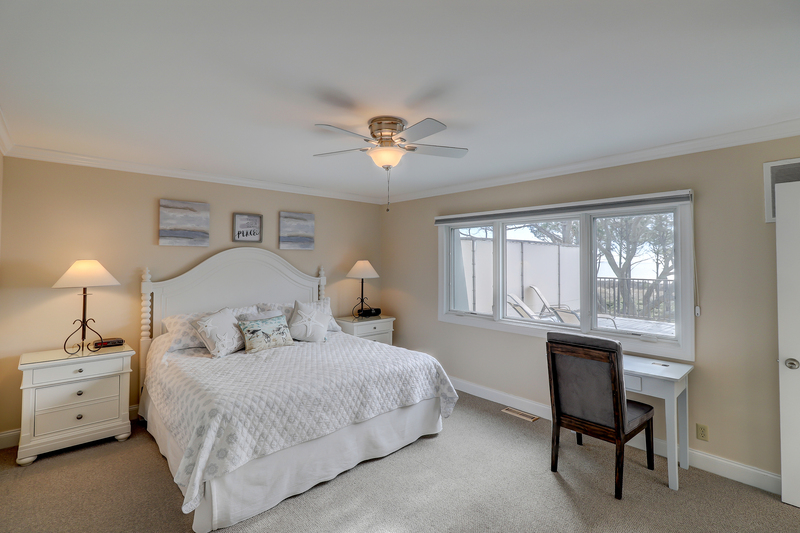 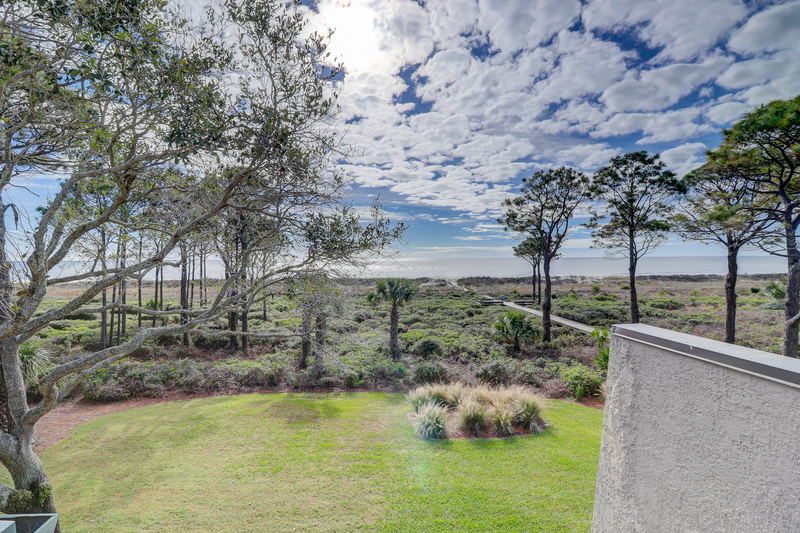 The spacious master bedroom is just off the upstairs landing and has a wide-open view of the ocean. 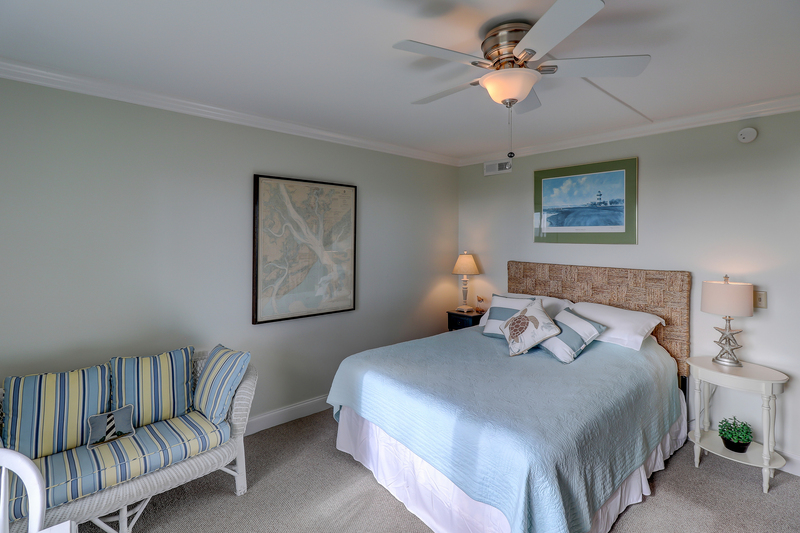 There is a king bed, wicker love seat, and 32" flat screen TV. 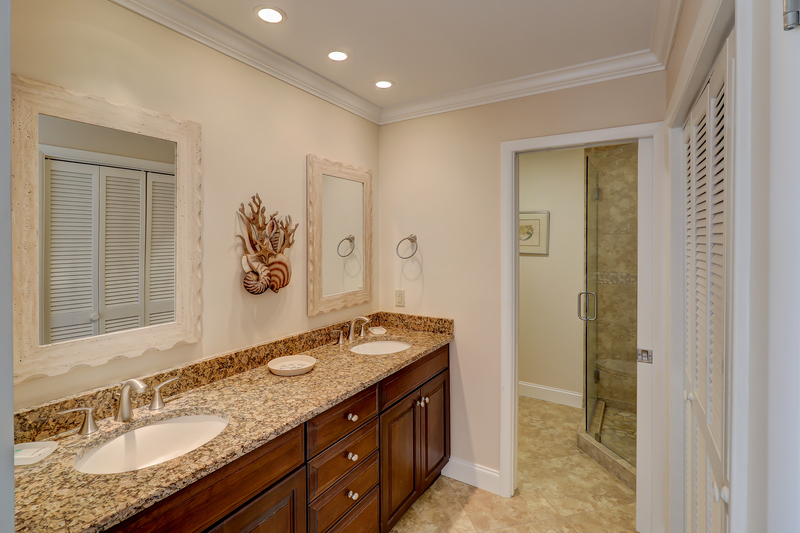 It has a beautiful private bath with double basin granite counters, dark oak custom cabinets, and a glass-enclosed walk-in shower surrounded in stone. 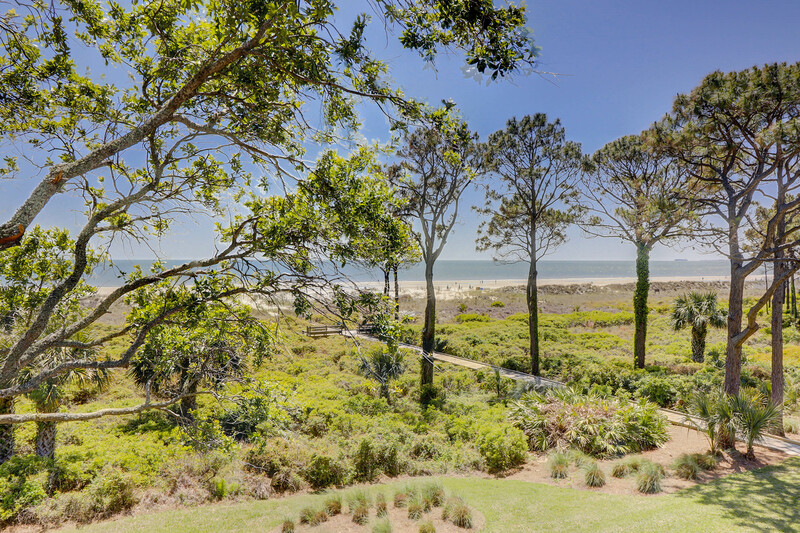 The Ocean Club is a popular oceanfront complex in the Forest Beach area. 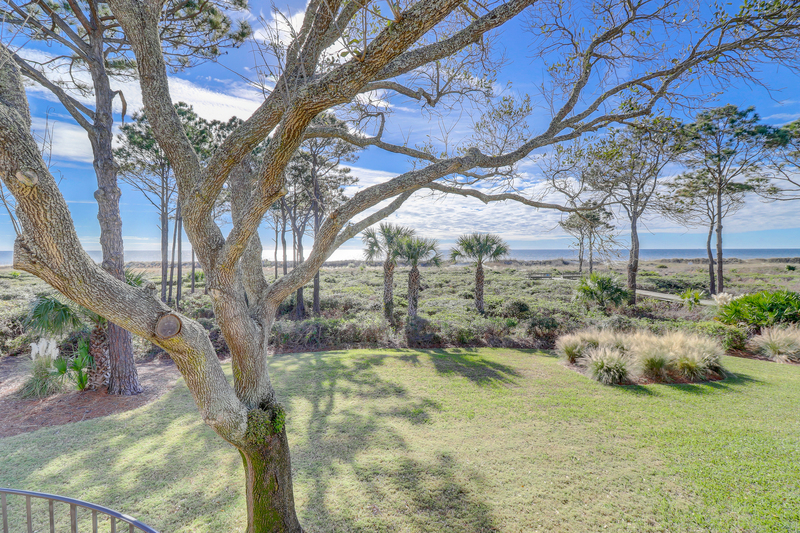 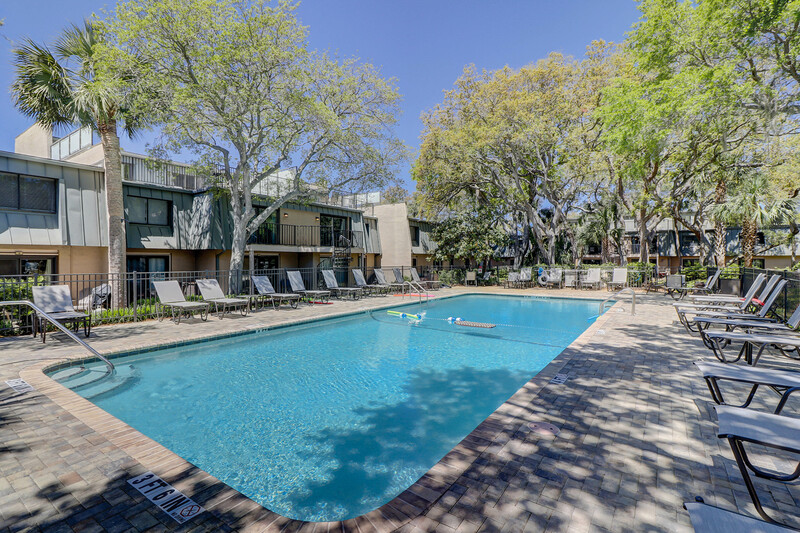 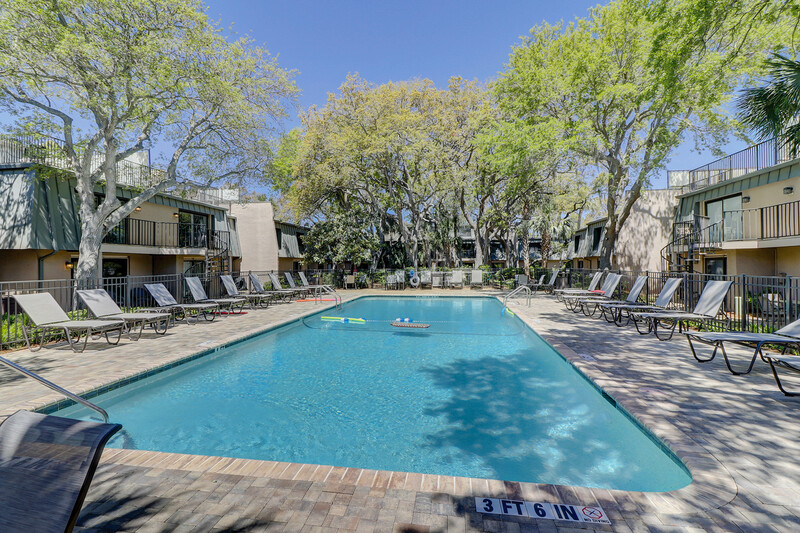 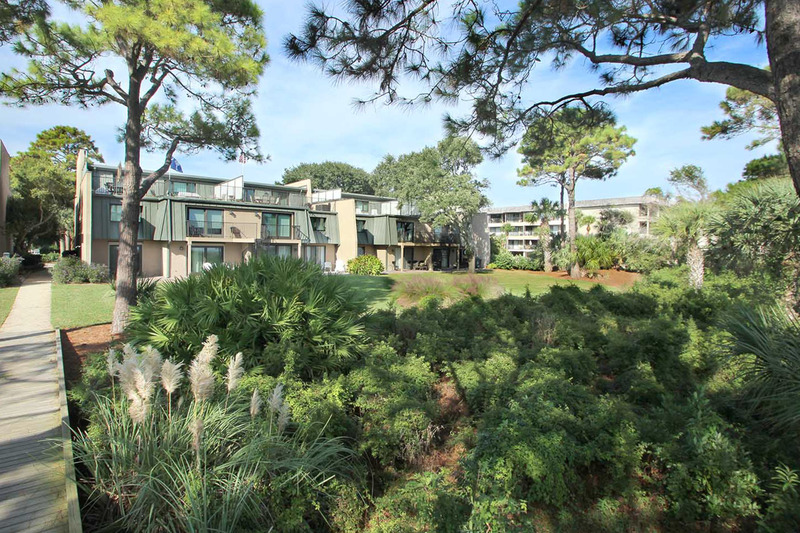 It has a very private and quite feel even though it is just a short stroll to all the activities of the Coligny Plaza area and the Coligny Beach Park. 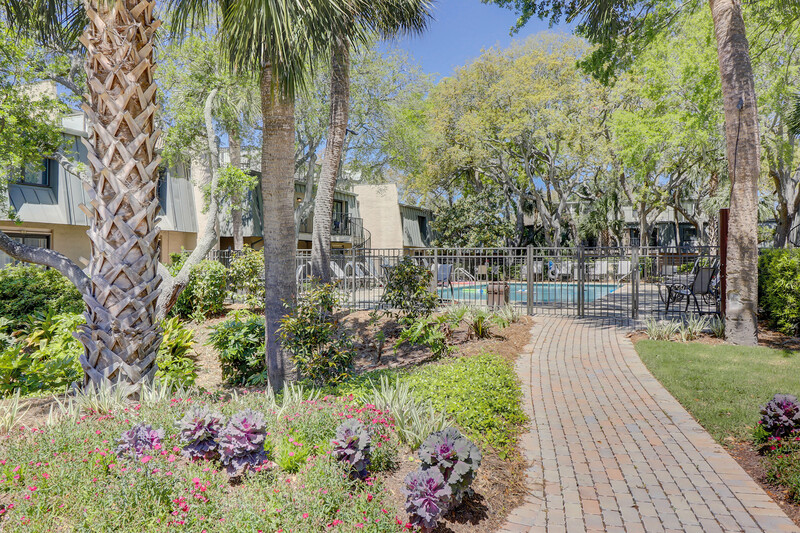 Shopping, restaurants, entertainment, and all the great amenities of Hilton Head Island are just minutes away. 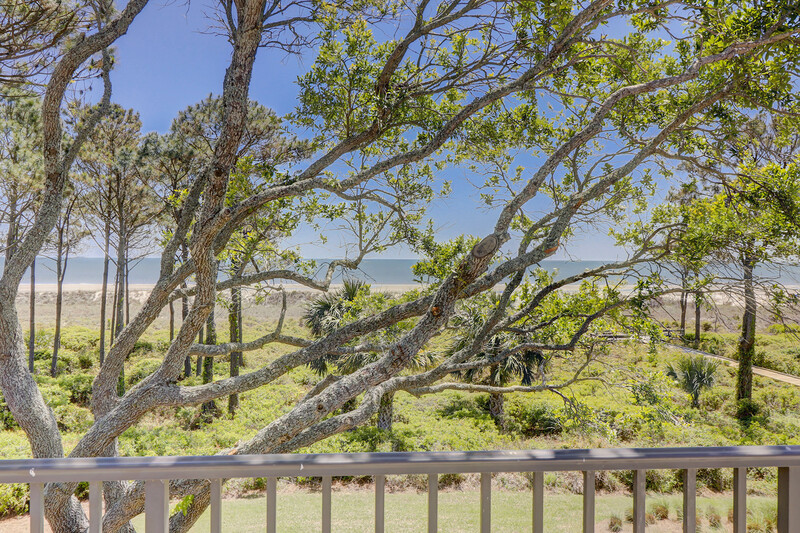 This will be a vacation sure to create great life-long memories!